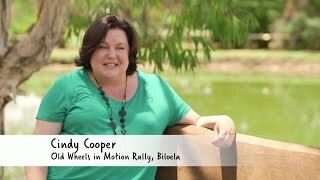 Biloela, the "Land of the White Cockatoo", will be abuzz with the sound of engines whirring, the clatter of horses hooves, the puffs of steam and smoke, as people from all over come to congregate and celebrate the nation's glorious past and the pioneering spirit of Australian's as the Callide Dawson Machinery Preservation Club Inc. hosts the 18th Annual Old Wheels In Motion Rally. The event will see exhibitors from Queensland, and across this great land, come together to host a working rally showcasing the uniqueness of the many vintage machines and collectables on display. Demonstrations and events, like the vintage tractor pull, the tractor balancing competition and the traditional grand parade, amalgamate with displays of traditional crafts and trades to educate and entertain. So, come along, explore, discover and celebrate the past! Child Children under 12 are provided free entry to this event. Concession $5 - $5 The concession ticket is for pension card holders and for students/children 12 years and over. Family $25 - $25 This ticket price includes entry for two adults and two children aged 12 and over.